The bad thing about events like this is that smiling this much makes my face muscles sore. 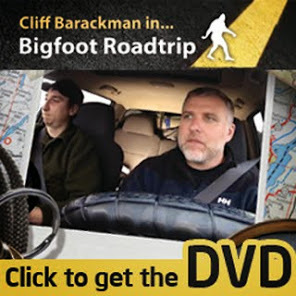 I just walked in from the Yakima Bigfoot Round-Up in honor of Bob Gimlin. I am sunburned, tired, and my face muscles got an amazing workout. The weekend isn't quite over for me, though. I am expecting two friends from the event to drop by in the next hour or so, after which we are going to a campfire at Thom Powell's home. Thom lives on the Clackamas River, not far from the Clackamas River Project Site. I hope to do some casual therming around Thom's property, and to perhaps show my friends the possible bigfoot sign that can be seen a short drive away. Many thanks to my friend Thom Powell for further extending my already fantastic weekend. I will be writing more detailed reports about the event over the next couple days. Suffice it to say for now that this was simply the best bigfoot conference I have ever been to. The presenters at the conference were fantastic, a new analysis was given of the PG film, and a new thermal imaging video of a sasquatch in North Carolina was premiered. More on all of these and more will be given this week. 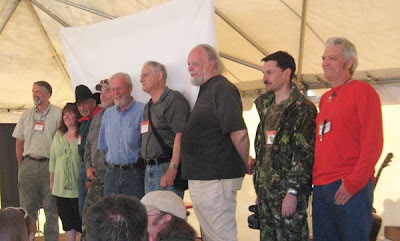 Dr. John Bindernagel, Chris Murphy, Bill Munns, Dimitry Pirkulov, and Scott Nelson. The crowd consisted of an amazing array of bigfooters from all over the world. The TBRC was well represented, and it was a great pleasure to see Eric Altman from the Pennsylvania Bigfoot Society whom I met at the 40th Anniversary Celebration of the PG Film where I was a presenter. 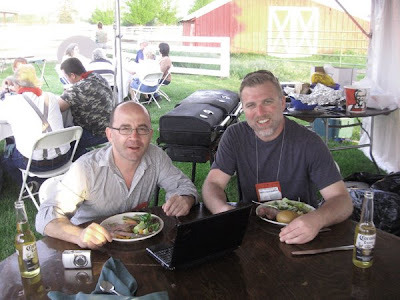 New friends were made as well, including Paul Cropper of Australia Yowie fame, and Dr. Robert Pyle. The campfires were amazing. Who knew that Dr. John Mionczynski played accordian? Not me! OK... I gotta go, as my friends have just arrived. Dinner and a campfire awaits. I'll fill you in on the details tomorrow. 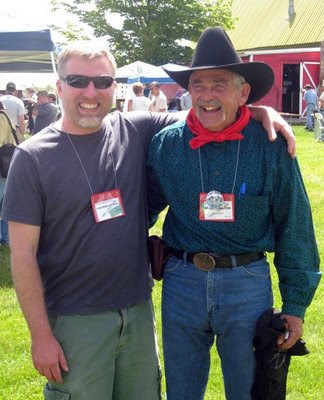 Tell Bob Gimlin what it was that him and Roger Patterson saw and filmed on October 20 1967 at Bluff Creek. Half man and half gorilla. A man made creature. Sorry - every expert in primate locomotion and biomechanics has clearly stated that the subject in the P-G film could not possibly have been a human in a suit.